Our Estimating Team bids jobs of all size including sewer and water main, site work, 4 lane highways, subdivisions, bridges, demolitions, anything and everything. They are responsible for all aspects of the projects, including daily site visits, subcontractors, material manager, scheduled completion and scope of work. They have the estimating software and take off tools available to give accurate excavation quantities. The Engineering department is continually updating their estimating tools to stay competitive. All four members of the Estimating Team have the Education and Engineering background to give you the precise estimate on any size project. They are backed by a large fleet of equipment, trucks and manpower to get the jobs done right and cost effective. 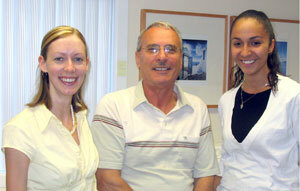 Cornwall Gravel’s Office staff, pictured here, work as a team to meet todays challenges as the company continues to grow. 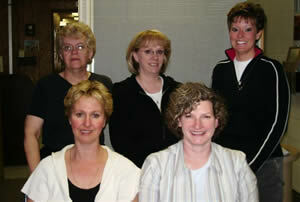 They are very dedicated, as shown by years of service, with 2 staff members being with the company for over 25 years. Cornwall Gravel’s Sales Team is ready to organize equipment, materials and services for contractors’ and clients’ construction requirements. 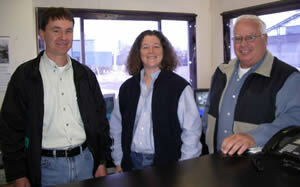 L-R Andre Forget (Sales Person/Safety Advisor), Michelle D’Amours (Dispatcher), Fraser Ouderkirk (General Manager). Our friendly Contract Administration Team is responsible for all aspects of administration for all the projects, from the Quebec border to Ottawa to Kingston. This includes subdivision and quarry development, municipal and private contracts and multi-million dollar MTO contracts. This Contract Administration Team has the Engineering, Management and Commerce background to keep all projects organized, oversee work crews schedules and ensure the scope of work is completed as per the spec.